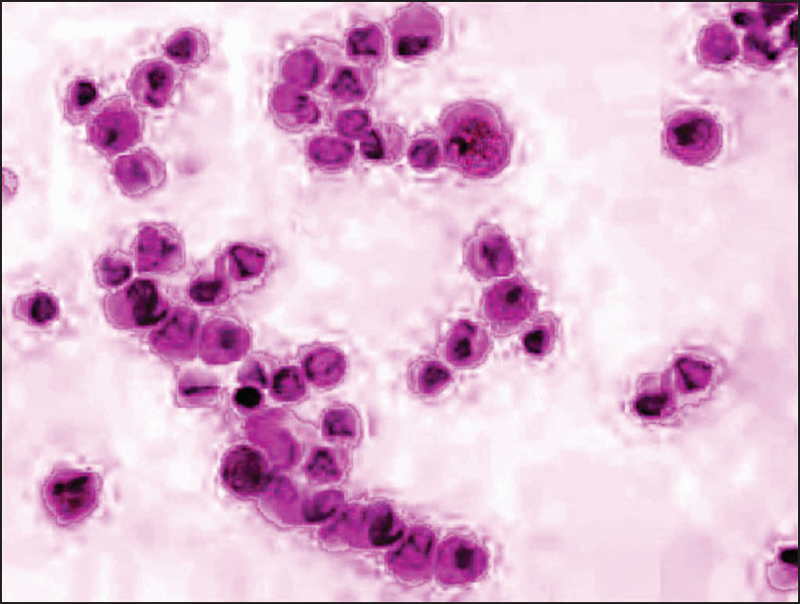 Background: Liquid-based cytology (LBC) is fast becoming a useful method in evaluating both gynecological and non-gynecological preparations, including fine needle aspiration (FNA) cytology. Even distribution of cells, decreasing obscuring background elements like blood and mucus, well preserved nuclear and cytoplasmic details and rapid fixation helps in better visualization of cells. Aim: This study was conducted to asses the diagnostic accuracy of liquid-based cytology versus conventional smears in fine needle aspiration samples. Study Design: In this prospective study, we had 110 cases, including 30 cases of breast, 40 of lymph node, 10 of salivary glands, 18 of thyroid and 12 of bone and soft tissue. In each case, two passes were performed. The first pass was for conventional preparation (CP) and the second pass yielded material for thin-prep (TP) preparation. Both CP and TP smears were compared for cellularity, background blood and necrotic cell debris, cell architecture, informative background, presence of a monolayer of cells and nuclear and cytoplasmic details by a semiquantitative scoring system. Wilcoxon's signed rank test on an SPSS program was used for statistical analysis. Results: Diagnostic accuracy was better in LBC smears compared with CP smears due to lack of background debris and better cell morphology, which was performed according to Wilcoxon's signed rank test, yielding a P-value of <0.001. However, in some cases, because of a decrease in cell size, clustering and altered background in LBC, a support of CP was essential. Conclusion: LBC performed on FNA samples can be a simple and valuable technique. Only in few selected cases, where background factor is an essential diagnostic clue, a combination of both CP and TP is necessary. Liquid-based cytology (LBC) as a technique was introduced and tried on Pap smear More Detailss. It received the Food and Drug Association (FDA) approval in 1996. Thereafter, this technique was performed for non-gynecological cytology, including conventional fine needle aspiration cytology (FNAC), guided FNAC and fluid cytology. The thin-prep (TP) smears were consistently devoid of obscuring elements and the cells were adequately preserved and evenly dispersed. Pitfalls noticed as cytomorphologic alterations in LBCs are small-sized cell clusters, with more single cells than sheets. The cells are generally smaller, occasionally show spindling, chromatin detail is attenuated, nucleoli are more prominent, intranuclear inclusion is difficult to visualize, decrease of extracellular particles is seen, there is a decrease in the number of small mononuclear cells/red blood cells/myoepithelial cells and the background matrix is altered. The pathologist should be cautious in interpreting fine needle aspirations prepared using TP if that is the only methodology employed. Familiarity with artifacts is essential to avoid misinterpretations. The advantages of LBC, independent of diagnostic accuracy and morphology, have been well described. ,, Although studies on LBC are documented for breast, non-gynecological specimen, thyroid, salivary gland and soft tissues, the authors supplemented bone lesions to all the above in their study. This study was conducted in a 2000-bedded hospital. The aim of our study was to determine the efficacy of LBC technology over conventional smear methods in FNAC samples. The study was performed on patients attending the Cytology Outpatient Department (OPD) of the hospital over a period of 2 years. Dry tap samples were not included in the study. Samples lost during processing were also rejected. A total of 110 cases were studied. For LBC, samples were processed using the Liquiprep TM processing kit and a special kit marketed by Cytec Corporation. Processing was performed manually in three steps, i.e. collection, concentration and cellular encapsulation. The LP cytology processing kit contains a preservative solution and a cellular base. Using the LBC processing kit, the first step is collection of samples. Here, the samples were pushed into a preservative solution, approximately three-times the volume of the sample, and left as such for at least 1 h. This is followed by the next step, i.e. concentration, where the preserved sample is centrifuged at 3000 rpm for 30 min. For cystic fluids, the supernatant fluid is discarded and, after adding the cleaning solution, it is again centrifuged for 15 min to increase its concentration. A pellet is produced, the supernatant fluid is discarded and a base solution of about 50 microl is added to the pellet to make a thin, homogenous suspension. This suspension was placed on an ethanol-cleaned glass slide and two circular smears of 1 cm diameter were made. The second option, which uses a cellular base solution, was used in certain cases, particularly if the sample contains necrotic substance or mucin. About 4 mL of cleansing solution was used in selected cases, along with the preservative solution, and the processing was performed in a similar fashion. We used both the options. For each FNAC, two passes were performed, the first pass was for CP and the second pass yielded material for the TP preparation, which was processed by the TP kit marketed by Cytcec Corporation. Different stains were used for staining the CP and LP smears, like HE, Pap and Diff Quick. 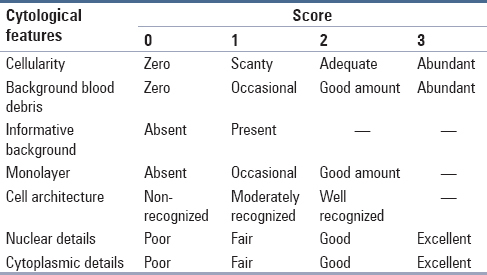 The representative CS and LB preparations were compared by a semiquantitative scoring system using several criteria [Table 1]. The concentration method used in the procedure was useful in the diagnosis of cystic lesions like aneurysmal bone cysts, Warthin's tumor of salivary glands and metastatic carcinoma. Statistical analysis was performed using the Wilcoxon signed rank test on the SPSS program (Chicago, IL, USA). 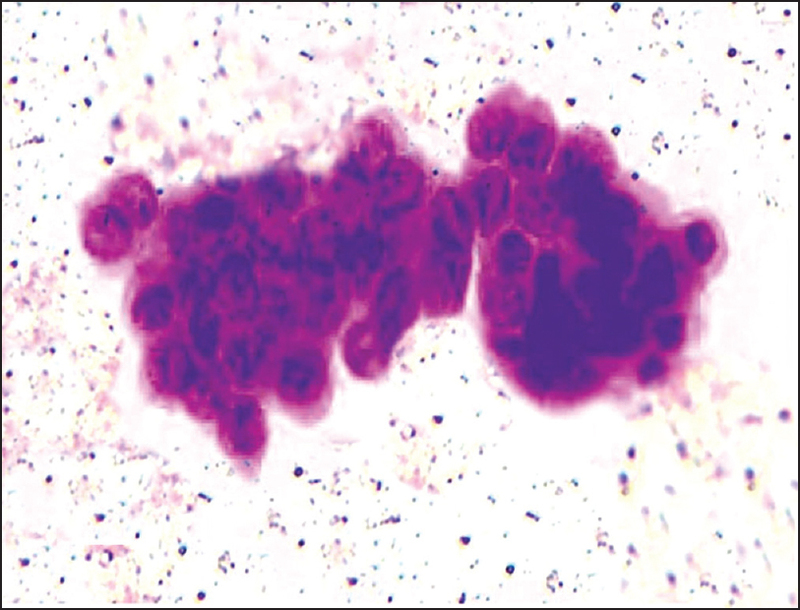 Every cytological diagnosis was recorded and tabulated and compiled to yield the P-value. P-value is the probability of occurrence of the research finding. P < 0.005 is significant. The lesser the P-value, the more accurate is the result. A total of 110 cases were studied, which were distributed among 30 cases of breast (10 fibroadenoma, four mastitis and 12 ductal carcinoma), 40 cases of lymph node (20 reactive hyperplasia, 12 granulomatous lymphadenitis, three lymphoma and five metastatic carcinoma), 10 cases of salivary gland (two sialadenitis, five mixed tumor, one Warthin's tumor and two mucoepidermoid carcinoma), 18 cases of thyroid (10 colloid goiter, four thyroiditis and four carcinoma cases) and 12 cases of soft tissue and bone lesions (five benign and seven malignant). Comparison between cytological features in LBC and CS was carried out using the Wilcoxon signed rank test separately for each organ in a tabular form, as shown in [Table 2]. In our study, in two cases of pleomorphic adenoma, one case of Warthin's tumor and two cases of colloid goiter, a support of CS was needed due to pitfalls in LBC described above. All the bony lesions were perfectly diagnosed in LBC. For breast cases, fibroadenoma, mastitis and ductal carcinoma were better diagnosed on LBC preparations due to clarity of the nuclear features [Figure 1]. Comparison data for lymph nodes suggested that the RS cells were more easily diagnosed on LBC smears due to monolayering. Immature lymphoid cells and foreign cells were also better visualized because of similar reasons. In case of salivary gland lesions, the mixed salivary tumor was better visualized in the conventional smear because of preservation of the stromal component. Cystic neoplasms of the salivary glands were better appreciated in LBC smears because of concentration. In sialoadenitis, the LBC preparations were superior to the CP smears. In the thyroid gland, LBCs were not very useful in goiter and infectious lesions, but they proved very useful in neoplastic lesions [Figure 2]. In lytic bone lesions like aneurismal bone cyst (ABC), giant cell tumor (GCT) and metastasis, better results were obtained by LBC preparations. In soft tissue lesions, LBC showed good results because of lack of background material. The study conducted by Mygdakos et al. is represented in the end of [Table 2]. In our study, FNAC was performed from various sites like breast, lymph node, salivary glands, thyroid and bone and soft tissue. In fibroadenoma breasts, although stromal fragments were lost, LBC proved to be useful in the diagnosis based on visualization of ductal aggregates and bipolar cells. For duct carcinomas, the same criteria were useful. , This is depicted in [Table 2]. According to the Wilcoxon signed ranked test for thyroid lesions [Table 2], LBC was not useful in goiter and infectious lesions. It gave better results in anaplastic and medullary carcinoma. In the salivary glands, LBC was not useful in cystic neoplasms like Warthin's tumor, mucoepidermoid and adenoid cystic carcinoma and comparable to the study by Parfitt et al. For bone and soft tissues, good results were obtained in LBC because of background clearing and concentration phenomenon. In all lesions of the lymph node, LBC proved to be a better option. Because of the pitfalls of LBC, as described above, in some selected cases of granulomatous lymphadenitis (lacking epitheloid cells), mucinous tumors (lack of mucin), colloid goiter (thin colloid fragmented) and pleomorphic adenomas of the salivary gland (myxoid background poor and present in droplets), a support on CS may prove useful. As observed by the authors, LBC of bony lesions do not require support of CS. TP preparations are superior to CPs with regard to clear background, monolayer cell preparation and cell preservation. It is easier and less time consuming to screen and interpret TP preparations because the cells are limited to smaller areas on clear backgrounds, with excellent cellular preservation. However, TP preparations are more expensive than CP and require some experience for interpretation. Familiarity with artifacts is essential to avoid misdiagnosis. LBC is strongly advocated in the best interest of public health, by improving the quality of the sample and reducing the likelihood of false-negative cytology results. Chacho MS, Mattie ME, Schwartz PE. Cytohistologic correlation rates between conventional papanicolaou smears and ThinPrep cervical cytology: A comparison. Cancer 2003;99:135-40. Mygdakos N, Nikoladiou S, Tzilvaki A, Tamiolakis D. Liquid based preparation (LBP) cytology versus conventional cytology (CS) in FNA samples from breast, thyroid, salivary glands and soft tissues. Our experience in crete (Greece). Rom J Morphol Embryol 2009;50: 245-50. Dey P, Luthra UK, Geprge J, Zuhairy F, George SS, Haji BI. Comparison of ThinPrep and conventional preparations on fine needle aspiration cytology material. Acta Cytol 2000;44:46-50. Konofaos P, Kontzoglou K, Georgoulakis J, Megalopoulou T, Zoumpouli C, Christoni Z, et al. The role of ThinPrep cytology in the evaluation of estrogen and progesterone receptor content of breast tumors. Surg Oncol 2006;15:257-66. Das DK, Al-Juwaiser A, George SS, Francis IM, Sathar SS, Sheikh ZA, et al. Cytomorphological and immunocytochemical study of non-Hodgkin's lymphoma in pleural effusion and ascitic fluid. Cytopathology 2007;18:157-67. Bédard YC, Pollett AF. Breast fine needle aspiration. A comparison of ThinPrep and conventional smears. Am J Clin Pathol 1999;111:523-27. Cochand-Priollet B, Prat JJ, Polvika M, Thienpont L, Dahan H, Wassef M, et al. Thyroid fine needle aspiration: The morphological features on ThinPrep slide preparations. Eighty cases with histological control. Cytopathology 2003;14:343-9. Saleh HA, Hammoud J, Zakaria R, Khan AZ. Comparison of ThinPrep and cell block preparation for the evaluation of thyroid epithelial lesions on fine needle aspiration biopsy. Cytojournal 2008;5:3. Parfitt JR, McLachlin CM, Weir MM. Comparison of ThinPrep and conventional smears in salivary gland fine needle aspiration biopsies. Cancer 2007;111:123-9.